Any fans of early Wes Craven stuff out there? Tobe Hooper maybe? For those in the know, these two filmmakers gave us "The Hills Have Eyes" and "The Texas Chain Saw Massacre" respectively. The originals not the remakes. These shocking features were brilliant for their time and although a little rough around the visual edges, still manage to elicit a surprising amount of fear and repulsion even today. Why do I bring this up? Because when writing about "Edge Of Isolation" I just can't help myself. That feeling I got when watching the above mentioned classic films, is almost identical to the one I got watching this. By no means am I writing this film is a copy in any way. This title from Jeff Houkal is it's own story. It's own fiction. I'm simply stating that anyone who has ever enjoyed the classic Craven or Hooper titles, will feel right at home here. Not so much by the onscreen action, rather the raw feeling "Edge Of Isolation" oozes. That sensation of being closed in upon. The revulsion you feel rather than see. If nothing else, this title will stifle any ambitions you have to go camping in the deep back woods. Lance O'Brien and his wife Kendra, after being stranded in the woods, come across an isolationist family living off the land. Waiting for their Jeep to be repaired, they agree to remain as guests in the Polifer home. The unusual actions of the family are simply because they've been living in isolation for so long. Right? Generations actually. As the story progresses, we come to find that all our fears have been true from the start. Things are not quite as they seem and for Lance himself, a special "double whammy" awaits explaining some very disturbing dreams he's been having. I'm pretty sure you can guess the individual elements of the plot simply by reading the poster. Seeing how everything plays out when watching this title is another story all together. 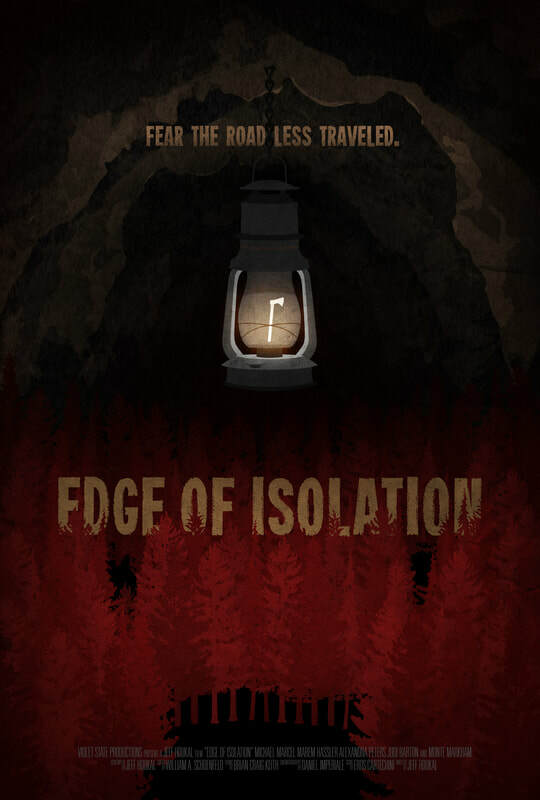 For a micro production, "Edge Of Isolation" doesn't disappoint. Very few instances give away that this film is anything but standard, budgeted studio fare. If you're into survival horror, this is a definite for you. A title worthy of being mentioned in the same sentence as the beloved directors listed above. The first few minutes of "EOI" did the trick for me. Some disturbing imagery and setup for the trip, all seemed on the up and up. Promising an at least decent film to come. By the time I witnessed the actual accident, I was unsure what to expect. An awkward edit made for some awkward viewing as our characters veered off the road. For those interested, this was a one off thing. The only real awkward moment I can think of from the top of my head. That's not to say that everything is perfect from then on after, just to say this particular segment was not commonplace afterwards. As a matter of fact, most of the production elements were well above average and really did push the title forward. The use of practical effects are a high note here. In the world of digital everything, it was nice to see some good old fashioned special effects. It really added to the mood and feel. The cast all felt right as well. "Right" in the sense of pure weirdness and even utter grossness sometimes. One particular scene involving masturbation, close to the ending of the film, really did the trick. Instantly activating my gag reflex. "EOI" is not a film that sets out to gross you out with such things, but those few moments really drive home the oddness of these characters. You'll know the scene when you see it. Trust me. It'll be etched in my mind for a long time yet. Ultimately this was a really good micro budgeted flick. It sets out to tell us a story and succeeds on near every level. An excellent addition for anyone who collects horror titles of this nature. Three and a half stars. Period.